I had a great shave this Sunday with the C40. Unfortunately the knot is shedding like a Labrador. Do you guys think ordering a knot and doing it myself is viable? Or best to send it off to a place? Of course it's viable if you have the right tools! I bought a horse hair brush, used it a few times and couldn't stand it. I like DIY projects so I picked up a synthetic knot from Maggard and got to work with my Dremel. Even better would be a drill press with a forstner bit of the appropriate size. Just snip the knot with scissors first. Alternatively, I've heard you can boil or steam the brush theoretically loosening the glue so you can just pull the knot out. I don't have any experience with that method though so I don't know if it really works or not. Good luck! I wouldn't recommend steam on that handle. Dremel my man! It's pretty easy just as wyzeone laid it out. Maggard is a good source of plissoft, tuxedo-like, or two band badger knots. Whipped Dog is a great source for boar or über soft knots. You can do it and that handle is worth it. Maggards it is. I gots the dremel and I gots the vice and drill. I really enjoy the retro aspect and I already have a plissoft from Razorock. I was looking online at polish and cleaner stuff for the handle. Most people seem to use flitz. But also turtle shell as well. I dunno. Let's just wing it and see f I can do this. Let us see your finished brush when done! Flitz is what I use. (05-09-2017, 06:26 PM)Ramjet Wrote: Maggards it is. I gots the dremel and I gots the vice and drill. 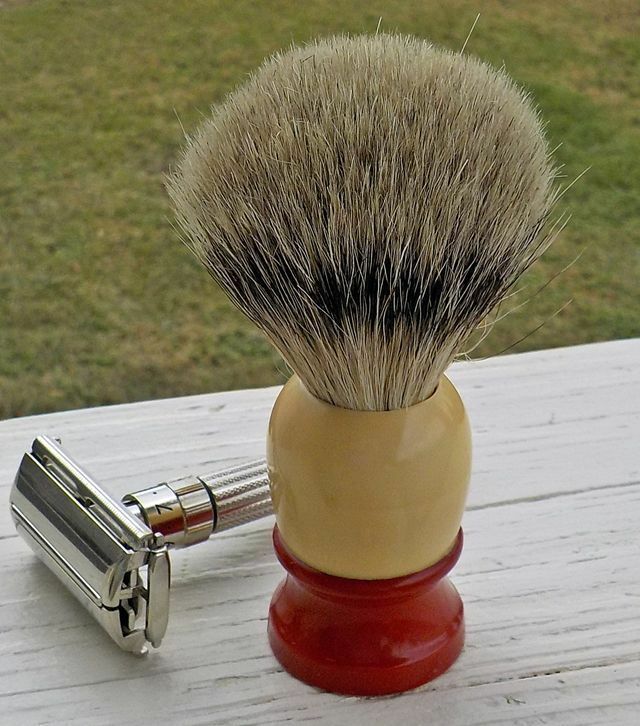 I really enjoy the retro aspect and I already have a plissoft from Razorock. (05-09-2017, 08:49 PM)Lipripper660 Wrote: Let us see your finished brush when done! Flitz is what I use. Guys, this is strictly a 'For Your Information'. I find that Flitz triggers my asthma, even when I use it on my back porch, in the open air. I find that MAAS does every bit as good a job and I have no problem with using it. Obviously plenty of folks use Flitz with no problems at all but if you have a respiratory disease, you might want to keep this in mind. Good for you for the willingness to try. If you happen to mess up, its a rather low cost learning class. Just landed the 2 band badger. I also picked up a few new bits for my dremel and am ready to get this party started. This is my C40 after installing a Whipped Dog Silvertip. Please share your completed project! It's inspirational!